Recumbent bikes are very important because they can help you get in shape easily. But, despite that, they will significantly improve your health. If you want to welcome the summer in top form, you should seriously consider purchasing one. Recumbent bikes’ design gives the user maximum comfort while. While working out you will sit lower to the ground and your legs in front of you. Recumbent bikes have similar benefits for your health as the regular bicycles. Recumbent bikes will provide you with cardiovascular exercise and they will work on large muscle groups. They will also increase the strength in your legs and the weight management because of the various movements. With burning calories on a recumbent bike, you will be able to maintain your weight easily. Recumbent bikes are much safer compared to upright bikes thanks to the larger seat and the back support. Also, they are putting less stress on the hip and the knees. That means they are beneficial for people with arthritis as well. While you are scouting for the perfect bike for you and your needs, you should learn something about bikes. There are two types of bikes, upright and recumbent. In this article, we will focus on one recumbent bike and we will try to tell you everything about it. We will try to explain and show you the good and bad sides of Schwinn 270 recumbent bike. But, we also did a deeper research to see how people who already purchased it are satisfied. At the end of the article, we included the FAQ to show you the complete picture of this bike. The bike with a 29-preset workout program is Schwinn’s top product of reclined bike collection. This bike also includes even two fitness tests. Despite that, this bike has several workouts which are great for heart rate control. If you are scouting for the perfect recumbent bike, you should keep in mind the possibilities of this bike. It would fit you perfectly because it is adjustable and it has a wide range of resistance. The Schwinn 270 recumbent bike will be a great addition to your household. Many members of your family can use this bike to get in their fitness shape. Instead of paying for a gym membership, all of you can ride this bike meaning it is a good saver. It has four user profiles which will allow every user to get the best workout. Tension Resistance: There are even 25 levels of resistance on this bike. This number will allow you to use the Schwinn 270 recumbent bike in different workout intensities. Also, it is perfect for both beginners and those who would enjoy a more intense workout. Workout Programs: It’s 29 pre-installed workout programs will also give you a wide range of workouts. You can make each workout different and more interesting based on your fitness condition and shape. Speed: The Schwinn 270 recumbent bike features a high inertia drive system with a perimeter weighted flywheel. This feature allows the bike to have a smooth and consistent workout. 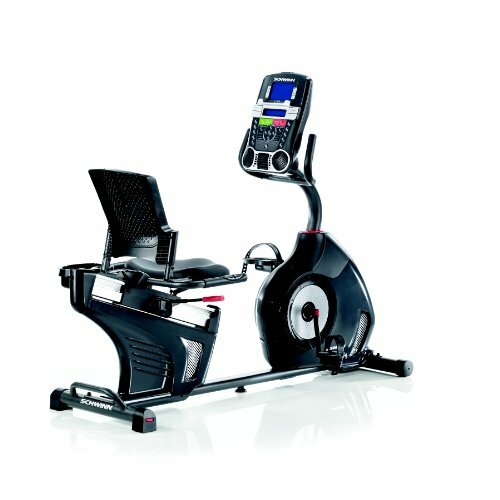 Heart Rate: The Schwinn 270 recumbent bike has it all. It features a heart rate monitoring on the handlebars and telemetry enabled for chest strap capability. Also, it has a 9 heart rate programs with custom settings. Fan: While we are talking about products with good value for the money, we are talking about the Schwinn 270. This recumbent bike has a three-speed cooling fan for a more pleasant and comfortable workout. Also, it has a water bottle holder to keep you hydrated during the workout. Transport Wheels: The transport wheels are always a good idea, especially when it comes to a fitness equipment. The transport wheels will allow you to move the bike wherever you want without much effort. Weight Capacity: The maximum weight capacity the Schwinn 270 can support is 300 LBS. Comfort: The Schwinn 270 recumbent bike has a large seat with cushioning support. It is comfortable for people of any size. Computer Features: You can enjoy your favorite songs on the in-console speaker with iPod or MP3 player input port. Also, this bike features a Bluetooth and a USB data transfer to Schwinn Connect or MyFitnessPal. Despite that, it also has a media shelf for even more enjoyable exercise experience. It features a big readable backlit LCD window system and 12 profile programs. The profile programs consist of 4 fun rides, 4 mountain rides, and 4 challenges. There are two tests to measure your improvements and profiles to store your information and workout data. You can also track the speed, time, distance, level, revolutions per minute, heart rate, calories and resistance on display. Warranty: Every customer wants to know about the product warranty. Schwinn 270 recumbent bike has a 10-year warranty for the frame. Also, there is a two-year mechanical, one-year electrical and 90-day labor warranty. How to See Whether Schwinn 270 Recumbent Bike Is The Perfect Bike For You? If you are investing in a fitness equipment, you probably would want to get the maximum of it. While you are searching for the best bike on the market, make sure you know what you want. The recumbent bikes aren’t designed for very intense workouts and you can’t exercise in many positions. Upright bikes, on the other hand, will allow you to exercise in a racing position which is much more intense. The Schwinn 270 recumbent bike will fit you perfectly if you want to workout with a maximum comfort. It has many features and almost every accessory needed to allow you to enjoy every workout on it. If you aren’t sure whether you should purchase the bike, ask yourself why you wouldn’t? If you have space and the money, what is stopping you from investing in yourself, your health and look? If you are putting your health aside, after some time, you will be regretting the decision you make today. Aren’t you sure the Schwinn 270 recumbent bike is the right choice for you? Take a look at the FAQ by bike shoppers and find the answer to your every question. What Type Of Drive System Does The Bike Have? The Schwinn 270 recumbent bike has a designed inertia drive system with a belt. The belt is allowing the bike to give you the most smooth and pleasant ride and workout experience. Can You Reach The Pedals If You’re Short (4 ft 11”)? Yes, you can reach the pedals because the Schwinn 270 has an adjustable seat. The adjustable design is allowing the bike to be perfect for many users regardless of their height. One person wrote in his review that his wife is 5 foot and she doesn’t have problems reaching the pedals. However, if you are worried you can reach the Schwinn’s customer support and they will get in touch with you. The Schwinn 270 recumbent bike is pretty easy to assemble thanks to the easy and clear instructions. If you want to do it alone, it will take you about one-two hours. Some people say it took them about half an hour for three people to assemble it. Everything you need to do assemble it is included in the box. However, you will probably need help getting it inside if you are alone because the box is pretty heavy. Yes, the Schwinn 270 recumbent bike is magnetic resistance and it is quiet and adjustable. If you are asking for a medical reason, be sure to consult with your doctor. What does Heart Rate Strap work With This Bike? If you want to know what heart rate strap works with Schwinn 270, the answer is EKG Grip Pulse Sensor. Is It Good For Tall People? The Schwinn 270 recumbent bike supports people up to 6’2” high. However, it all depends, for some people it can be comfortable for some will be cramped. If you are around 6’2” tall, this bike wouldn’t be the perfect choice for you. Our goal is to give you the best information about the bike. Meaning you should know that if you are over 6’2” tall, you will probably have problems with the pedals. According to a customer, this bike is surprisingly quiet and flawless. The pedaling is smooth and it is completely silent. That means you can workout even while some family member is taking a nap and you won’t disturb anyone. Also, the fan is super quiet which will also allow you to cool without disturbing anyone’s peace. You can also watch TV or listen to your favorite songs while working out. The assembled dimensions of the Schwinn 270 recumbent bike are 64” L X 27.7” W c 49.9 H (162.5 x 70.3 x 126.8 cm). Before you purchase this bike we advise you to make sure you have the needed space in your home. During Use The Console Beeps Every 2 Minutes. Can This Time Between Beeps Be Adjust? The interval alert happens each time you complete one interval; the bike comes with a preset interval at two minutes. It is possible to turn the beeping sound off, but it isn’t possible to adjust the length of the intervals. You can see the Console Setup Mode on page 36 in the attached manual. The Schwinn 270 recumbent bike is one of the greatest bikes on the market. It will allow you to feel excellent in your skin and it will improve your physical and mental health. While you are investing in this piece of equipment, you are also investing in yourself and your health. The Schwinn 270 recumbent bike is currently one of the best options on the market. For the price of one bike, your whole family can exercise on it because of the multiple user profiles. Compared to the other low-priced bikes, the Schwinn 270 bike is the most impressive. If you don’t know the price, you would expect it to be over $1,000 or more considering all the features. Wouldn’t it be nice to get so much for a small price and push it to its maximum potential? Stop neglecting your health and invest into something which will change your whole life.